Frugal For You: Target: Buy Select DVDs, Get $5 or $8 Hollywood Movie Money! Target: Buy Select DVDs, Get $5 or $8 Hollywood Movie Money! I was enjoying some Mommy time at Target and happened upon some deals in the movie section. Plenty of action movies had peelies for $5 or $8 off a movie ticket. If it's a DVD, the coupon is for $5 off a movie, for Blu-ray it's an $8 coupon. Visit WB Summer Promo to check out the movies out at the theater. I saw Pacific Rim, We're the Millers, and The Conjuring. Have you seen more DVDs with Hollywood Movie Money peelies on them at Wal-Mart like the ones when the Hobbit movie came out? I saw a bunch at my store today but did not get a picture or the info. That store was pretty rough and very crowded. I think the DVDs were $8 something and the movie ticket was up to $8 off. 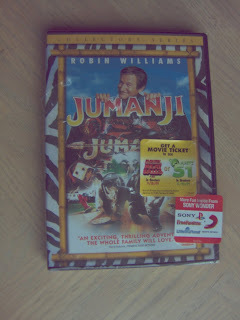 I remember the first time I saw "Hollywood Movie Money" peelie was October 2009 from a Jumanji DVD! That DVD was $3 and we got a FREE movie ticket too!